We are a well-renowned organization in the industry to provide our patrons the best quality array of Telescopic Boom Lift. 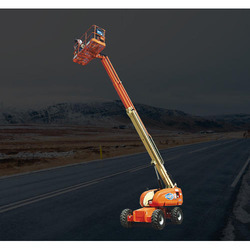 We bring forth our vast industrial experience and expertise in this business, involved in offering a high-quality range of Telescopic Boom Lift. on various parameters like efficiency, durability and safety while using it. These products are mainly used for manufacturing cylindrical jobs and others with high horizontal reach. We are the leading manufacturer of eot cranes, over head cranes, jib cranes, mobile cranes, pick n carry cranes in hyderabad and in major area of south india including andhra pradesh, orissa, karnataka, bangalore, tamil nadu, kerala, etc. Type of Boom: Articulated Booms. Our company has gained immense experience in the field of presenting Hydraulic Hand Mobile Crane. JLG 80HX Boom lift available for hire and also for sale with 80feet working height and 225 maximum lifting capacity. We Provide used equipments of boomlifts / scissor lifts ranges from 8mts working height to 45 mts working height. 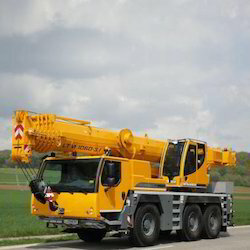 We are offering highly efficient Mobile Cranes to our clients.